The Sultanate of Ternate is one of the oldest Muslim kingdoms in Indonesia, established by Baab Mashur Malamo in 1257. It reached its Golden Age during the reign of Sultan Baabullah (1570–1583) and encompassed most of the eastern part of Indonesia and a part of southern Philippines. Ternate was a major producer of cloves and a regional power from the 15th to 17th centuries. The dynasty founded by Baab Mashur Malamo continues to the present, as does the Sultanate itself, although it no longer holds any political power. The sultanate was originally named the Kingdom of Gapi, but later changed the name to be based on that of its capital, Ternate. Ternate and neighbouring Tidore were the world's single major producer of cloves, upon which their rulers became among the wealthiest and most powerful sultans in the Indonesian region. Much of their wealth, however, was wasted fighting each other. Up until the Dutch completed the colonisation of Maluku in the 19th century, the Sultans of Ternate ruled empires that claimed at least nominal influence as far as Ambon, Sulawesi and Papua. The peak of Ternate's power came near the end of the 16th century, under Sultan Baabullah (1570–1583), when it had influence over most of the eastern part of Sulawesi, the Ambon and Seram area, Timor island, parts of southern Mindanao and as well as parts of Papua. It frequently engaged in fierce competition for control of its periphery with the nearby Sultanate of Tidore. According to historian Leonard Andaya, Ternate's "dualistic" rivalry with Tidore is a dominant theme in the early history of the Maluku Islands. The first Europeans to stay on Ternate were part of the Portuguese expedition of Francisco Serrão out of Malacca, which was shipwrecked near Seram and rescued by local residents. Sultan Bayanullah of Ternate (1500–1522) heard of their stranding and, seeing a chance to ally himself with a powerful foreign nation, he brought them to Ternate in 1512. The Portuguese were permitted to build a fort on the island, today known as Kastella, construction of which began in 1522, but relations between the Ternateans and Portuguese were strained from the start. An outpost far from Europe generally only attracted the most desperate and avaricious, such that the generally poor behaviour of the Portuguese, combined with feeble attempts at Christianisation, strained relations with Ternate's Muslim ruler. In 1535 Sultan Tabariji was deposed and sent to Goa by the Portuguese. He converted to Christianity and changed his name to Dom Manuel. After being declared innocent of the charges against him he was sent back to re-assume his throne; however, he died en route in Malacca in 1545. He had though bequeathed the island of Ambon to his Portuguese godfather, Jordão de Freitas. Following the murder of Sultan Hairun at the hands of the Portuguese, the Ternateans expelled the Portuguese in 1575 after a five-year siege. Ambon became the new centre for Portuguese activities in Maluku. European power in the region was weak and Ternate became an expanding, fiercely Islamic and anti-Portuguese state under the rule of Sultan Baab Ullah (r. 1570–1583) and his son Sultan Said. Spanish forces captured the former Portuguese fort from the Ternatese in 1606, deporting the Ternate Sultan and his entourage to Manila. In 1607 the Dutch came back to Ternate, where with the help of Ternateans they built a fort in Malayo. The island was divided between the two powers: the Spaniards were allied with Tidore and the Dutch with their Ternaten allies. For the Ternaten rulers, the Dutch were a useful, if not particularly welcome, presence that gave them military advantages against Tidore and the Spanish. Particularly under Sultan Hamzah (1627–1648), Ternate expanded its territory and strengthened its control over the periphery. Dutch influence over the kingdom was limited, though Hamzah and his grandnephew and successor, Sultan Mandar Syah (1648–1675) did concede some regions to the Dutch East India Company (VOC) in exchange for help controlling rebellions there. The Spaniards abandoned Maluku in 1663. Desiring to restore Ternate to its former glory and expel the western power, Sultan Sibori of Ternate (1675–1691) declared war to the Dutch, but the power of Ternate had greatly reduced over the years, he lost and was forced to concede more of his lands to the Dutch by a treaty in 1683. By this treaty, Ternate had lost its equal position with the Dutch and became a vassal. However, the Sultans of Ternate and its people were never fully under Dutch control until its annexation in 1914. In the 18th century Ternate was the site of a VOC governorship, which attempted to control all trade in the northern Moluccas. By the 19th century, the spice trade had declined substantially. Hence the region was less central to the Netherlands colonial state, but the Dutch maintained a presence in the region to prevent another colonial power from occupying it. After the VOC was nationalised by the Dutch government in 1800, Ternate became part of the Government of the Moluccas (Gouvernement der Molukken). Ternate was occupied by British forces in 1810 before being returned to Dutch control in 1817. In 1824 it became the capital of a residency (administrative region) covering Halmahera, the entire west coast of New Guinea, and the central east coast of Sulawesi. 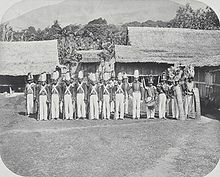 By 1867 all of Dutch-occupied New Guinea had been added to the residency, but then its region was gradually transferred to Ambon (Amboina) before being dissolved into that residency in 1922. Sultan Haji Muhammad Usman (1896–1914) made a last attempt to drive out the Dutch by instigating revolts in the region; he failed and was dethroned, his wealth being confiscated, and he was exiled to Bandung, where he lived his remaining years until 1927. The throne of Ternate was left vacant from 1914 to 1927, until the board of ministers under the blessing of the Dutch created Crown Prince Iskandar Muhammad Jabir the next Sultan. Sultan Mudaffar Sjah II died in 2015. The male members of his wife's family, the Dutch Van Gelders, were named Prince of Ternate in 2012, and rule the island since Mudaffar's death. The existing sultan's palace was built in 1796 and restored in a semi-colonial style and is now partly a museum as well as the sultan's home. The museum exhibits the genealogy of the Ternatean royal family from 1257, a collection of Portuguese and Dutch helmets, swords and armour, and memorabilia from the previous sultans. ^ Witton, Patrick (2003). Indonesia (7th edition). Melbourne: Lonely Planet. p. 821. ISBN 1-74059-154-2. ^ Ricklefs, M.C. (1993). A History of Modern Indonesia Since c. 1300, 2nd Edition. London: MacMillan. p. 24. ISBN 0-333-57689-6. ^ Ricklefs, M.C. (1993). A History of Modern Indonesia Since c. 1300, 2nd Edition. London: MacMillan. p. 25. ISBN 0-333-57689-6.